After the initial riot, from which the people gained control of Paris, Frances military was in the hands of the revolutionary leaders. This Shift lead to the rise of Napoleon Bonaparte . 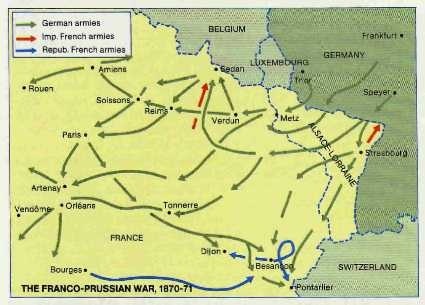 During the Revolution France was being invaded by a joint Prussian-Austrian army from the north east. Luckily for France the revolution brought a sense of nationalism for the French soldiers and citizens. Later on more countries decide to join in at defeating France's crippled government, only to recede leaving just Austria and England in the war. The French Revolution brought completely new society to France. With King Louie XIV no longer having any power, the revolutionaries took over and attempted at setting up a democratic for of government. Although, most of the initial revolutionary leaders died with the revolution, thus the first ideals of the new form government became skewed. It was still democracy, it was just that the new rulers still had a great deal of power over the people. Socially the Revolution, brought freedom and overall prosperity,especially for the middle class. Workers gain better working conditions; the bread famine ended; free public education formed, despite social class; and women move a great deal up in the social spectrum. Also the catholic church in France fell with the monarchy. People began to cast out anything that was related to the catholic church, bibils and crosses were destroyed, and they blamed a great deal of the horrible living conditions on the church. The revolutionaries even replaced the christian calendar with a new french calendar started with the french revolution as year one. The most memorable invention that influenced the french revolution was by far the guillotine. The guillotine became the nation symbol for the revolutionaries, as they used it constantly thought the time period. Many histories would even go as far to argue that the revolution wouldn't have turned out the way it did with out it. Also the revolution itself brought about new military technologies, such as improved cannons and more accurate rifles. These were critical to the defense of France from the invading countries after the revolution. In terms of Frances economy, it saw a general growth after the revolution. When King Louie reigned, the country face extreme famine and depression, due the great deal of spending on Versailles and food hording for events within the palace. In order to fund such expenses, the kind decided to put heavy taxes on his people but did not tax the clergy. All of this end when the revolutionaries came into power. Taxes were lowered substantially, famine ended, and working conditions improved. Also the new sense of nationalism and the war against Austria help increase the productivity of the France. That quickly brought them back to a stable economy for the next few decades to come.